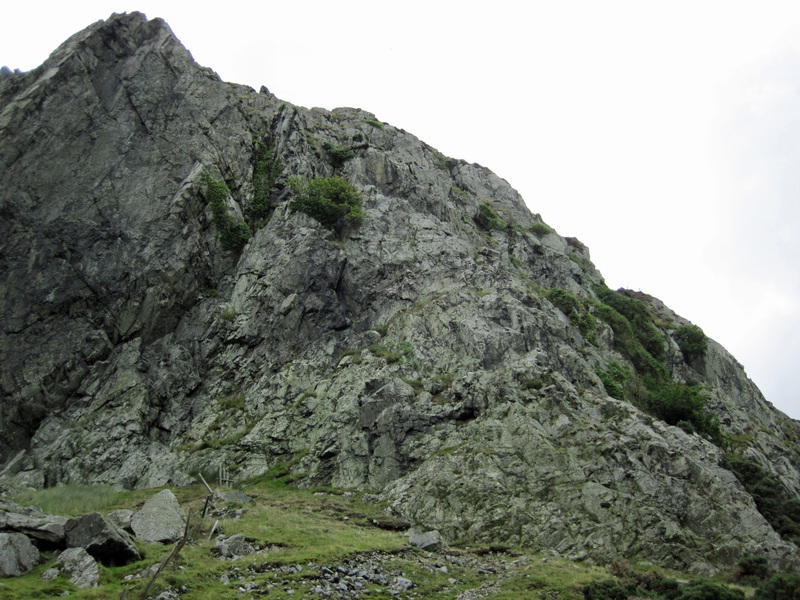 Craig yr Aderyn is a crag in the southern part of Snowdonia National Park in North Wales. It’s a little out of the way, but has a lovely location as an island of rock in the otherwise flat as a pancake Dysnni Valley. The guide book for this crag is Meirionnydd from the Climbers’ Club Guides to Wales. The guide book says of the VDiff climb The Buttress that “protection is rather difficult to find.” I found this a bit of an understatement as I went up the first pitch and so was pleased that the guide book stated for pitch 1 “spike belay on the left“, while for pitch 2 it said “metal spike under the final steep wall” and “…more metal spike belays” for the end of pitch 3. Unfortunately, between this guide book being published in 2002 and my climb in the summer of 2011, all of these metal spike belay anchors had been removed. At first I thought I was off-route and spent ages looking around for the safe, reassuring metal spikes to anchor to. I also had my second repeatedly shout up the route description the guide book. In the end, I worked out that there were no metal spikes and did as best as I could putting anchors into the rock. With too few runners in because of the limited gear placements and some surprisingly challenging climbing for the grade, this was all a bit of a nerve racking experience and I was glad to the finish the climb. This climb was a much riskier undertaking than it should have been. 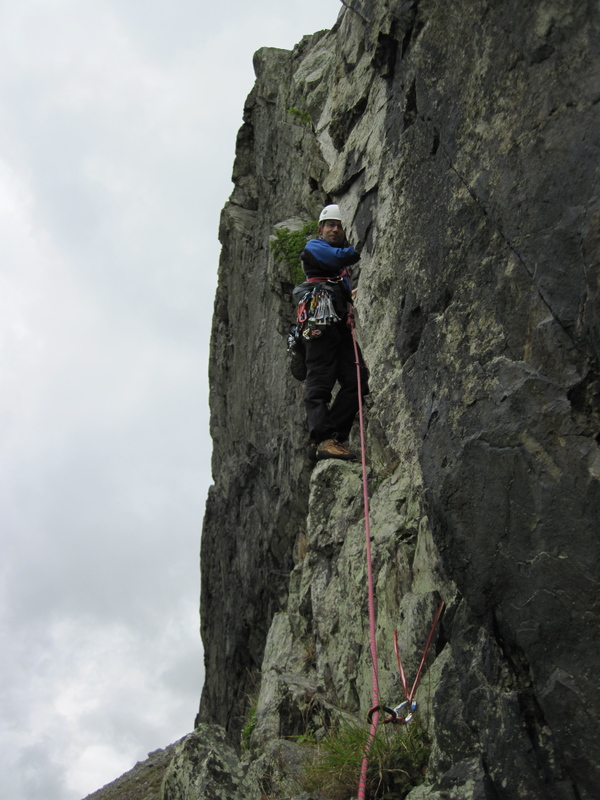 Me climbing The Buttress at Craig yr Aderyn. Ouch! Who took the spikes out? Local purists? I always think purists could just ignore fixed protection rather than remove it! I don’t know. It’s possible, but it seems strange to conclude that the spikes were “unethical” because there weren’t many other options to use as anchors and without them the climb was a lot harder (and not as safe). I’ve wondered if the spikes had become degraded and they had not bothered to replace them. Either way – it’s not a nice surprise on a climb.